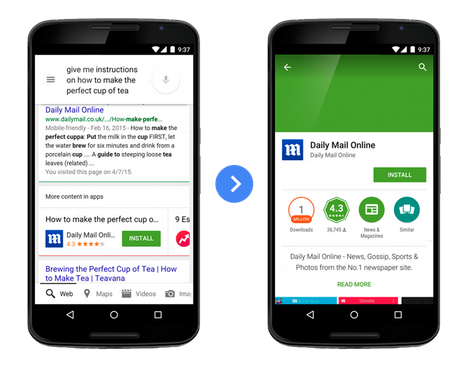 Did you know that Google also indexes the content of Apps? In fact Google has indexed 30 billion links within Android apps. Up to last week Google would include links to relevant apps in the mobile search results it showed to Android users, provided they had the app already installed. Apparently the need for apps to already be installed was a bone of contention for many Android app developers. Clearly Google wants to keep Android developers happy and last week announced a big change regarding the inclusion of Android apps in mobile search results. Now relevant links to apps will be shown, even if apps aren’t already installed on the searcher’s mobile device. Furthermore mobile users will be encouraged to install the apps with App Install buttons appearing in the search results. Note, for apps to be included they must have implemented App Indexing so that Google can crawl and index their content. If your business has invested time and money developing an Android App it will be in your best interest to ensure App Indexing has been implemented. This means your app will have the opportunity of appearing in Google search results when your app is relevant to a search done on Android devices. Appearing in these results can lead to an increase in your install base plus drive usage of your app.